Boy, I'm such a slacker. I debated even posting this week cuz I have been so bad. I think I may combine some of my goals to make them look more manageable. I feel like this week has been so crazy and gone quickly. And I still need to print out my list of goals so I can see it all the time. If you plan to have an online business you need to find a way to organize how people buy your item. Finding the right shopping cart software can make all the difference in how well your business runs. You can set up your online shopping cart at www.ashopcommerce.com. They offer easy-to-use shopping cart software. With this award winning software you can accept credit cards online, fully customize the look of your online store, and start using it right away. It is search engine friendly, easy to use, and there is no installation required. This ecommerce software is affordable and they have great customer service. And you can get started using this great shopping cart software with a free 10 day trial. If you sign up for a 24 month plan you will get a free custom online store design. Whether you are a beginner or a professional, this software will work for you. Check out www.ashopcommerce.com now to start selling. OK, I promised to have a giveaway and so I will :) Today I am giving away a few items from my crochet site, Kara's Custom Crochet. The first item I'm giving away is a Sweet Lace Baby Blanket (value $75). I'm sorry I don't have a picture to show you, but I will put the picture up once I get it finished. It will be mostly white with flecks of pastel color. Just let me know if it's for a boy or girl or neutral, so I can do the edging in blue, pink, or green. 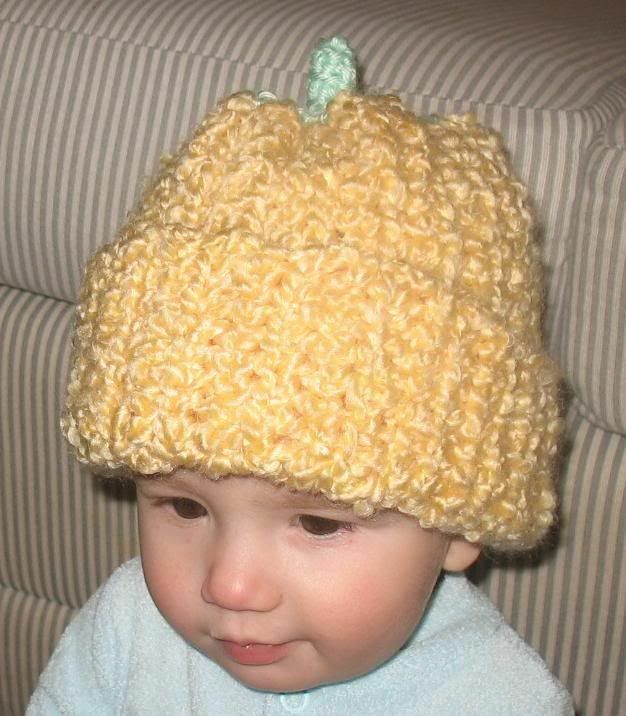 I will also be giving away 2 runner up prizes- Pumpkin Hats (value $10), in baby or toddler size, just in time for Halloween! These are sooo adorable. To enter, add your name to Mr Linky and link back in a blog post (unless you don't have a blog, just leave an email address). Open to USA and Canadian residents only. The contest will be open until Friday the 28th, 8pm MST. I will draw the winners and post them asap when it's over. My giveaway ends in about 3 hours, so make sure you've entered if you wanted to! So far the odds of winning are pretty good since we only have 13 entrants and one doesn't qualify until they've put a linkback in a blog post. I did forget to mention in the original post that we do have cats in case anyone is allergic. Well, I haven't gotten far on my to-do list yet. The boys have been driving me nuts! I don't know what's gotten into Toddler lately but he just won't do anything I say. And Baby keeps getting into my new DVDs and throwing them around and being so whiney. Little Baby has a double ear infection but he's the best behaved of the 3! Luckily I just got them all down for naps at the same time, so it's time for me to get cleaning, even though I'd much rather just take a nap too lol. I need a to-do list for today cuz I have lots to do and I might forget something. I really need to clean since we will have family coming over this weekend and the house is a total mess. We also need to go shopping for Toddler's birthday presents, cake, and stuff. Fun stuff. - Pretty good, but tired. It's so hard to wake up now that it's stays dark later. - Driving through a blizzard at night Christmas Eve through a canyon. - Hm, how about England? I've always wanted to visit Europe. 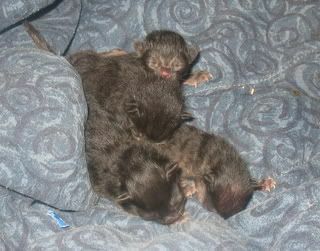 Today I am thankful for our cute little kittens that were born this week. I love babies! I am also thankful for Toddler, who is 3 today. He is such a wonderful little boy. And I'm thankful we are going out to eat tonight to celebrate, cuz I do not feel like cooking lol. Today is Toddler's 3rd Birthday! I can't believe how quickly the last 3 years have gone. I always knew I wanted to be a mom and was so excited to find out when I was expecting him! I loved being pregnant and didn't have too much morning sickness. At this time 3 years ago I was quietly laboring at home and Hubby was getting ready to head off to class. (It was midterms week, he couldn't miss class.) That afternoon we headed to the hospital with family and at 10:04pm September 27, 2004 Toddler was born screaming, by c-section. I was crying and the first time I saw him said "Oh, he's so cute!" I wasn't able to hold him, I was shaking so bad I could barely touch him. I finally got to hold him for the first time when he was 2 hours old. I was instantly in love. He has always been very laid back and calm, he was such an easy baby. When we had Baby he was so excited to help out and give kisses and he is a good big brother. He loves to play and is so sweet and smart. His favorite thing to do is draw and color and he is constantly creating little masterpieces for us. I love my little boy so much and am so happy to call myself his Mommy. 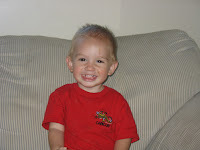 We are having his birthday party on Saturday, it is a combined party with his friend, Michelle's daughter. I still need to go shopping for birthday presents and cake and stuff. My mom called him this morning to sing Happy Birthday and he's been singing "Happy Birthday to me!" over and over lol. Thought I'd post an update on our new little kitties. They are mostly doing very well and mama cat is being a great mommy. 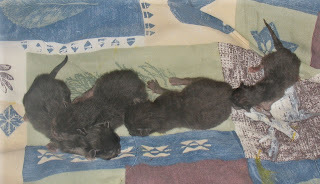 But one of the kittens is a little runt, seriously only half the size of the other 3, and was having a hard time nursing. He couldn't find a spot or latch on well, plus he kept getting pushed down by the 3 bigger kittens. I was worried that he would starve or get sick. So tonight I went and bought some kitty milk replacement (kitty formula basically) and gave him a tiny bottle and he chugged it down. Hopefully he'll be able to learn to nurse better, but until then I'm glad I can supplement him with the formula so he can grow and get stronger, since he is so tiny and weak. Anyway, there's my update :) I'll try to get pics tomorrow so you can see how tiny he is compared to the others. Look what I woke up to this morning! 4 cute little black kittens! Our cat Stars had her babies during the night. I went down and could hear the cats all fighting so I opened the door and tried to break them up (note to self: do not try to break up cats with a bare foot unless you like the torn and bleeding look) and Stars chased the other 2 out and came back and there on the blankets were 4 little kitties, all of them black. I love kittens! It is so cold here today! It's 40*F. Way too cold for me! In our house it's 69* which is still too cold. I have thick, fuzzy socks on and am probably going to grab a sweater, I HATE cold! The heaters are going, trying to warm it up a bit. Doesn't help that we had a window open all night, brr. Of course my silly Toddler is still playing outside in the cold, he doesn't seem to mind it. Must be thick-skinned like his dad. Check back later when I post a giveaway in celebration of my blog's first birthday!!! Holy cow our kids are driving us nuts today! Neither of them want to nap. We've been trying to get them to sleep for 3 hours! I don't know where they got so much energy but if Toddler doesn't go to sleep soon I'm thinking of coming up with some type of straight jacket to keep him still for a bit. I think Hubby finally got Baby to sleep. We also spent a few hours rearranging our living room and that was hard work, especially since I think I've gotten tendinitis in my right thumb so it was hard for me to help, and I'm just a wimp lol. Dinner will be done soon so I better go. I didn't do too bad this week :) I still have been terribly slacking in my cleaning goals. I really need to work on that this week. My new goal was drinking 4 cups of water a day. I forgot about it half the week but I did do it the last 3 days so that's great. I have a 32oz mug I fill up in the morning and put at my desk and just drink from it throughout the day. No new goals this week, just keep working on the ones that need it, mainly the cleaning. I'm thinking I might switch my goal of 1 load of laundry a day to maybe just having 2 laundry days a week. Not sure though, I'll try it out and see if that works better for me. I'm so excited :D On a messageboard I visit every day, there were 5 ladies all due within about a month of each other, one with twins. So far 2 have delivered. One of the ladies was induce on Sunday and had a baby girl who was 10lb 11oz! And she had him naturally, wow! The other lady had to be on progesterone shots through most of her pregnancy and suffered from HELLP with her other 2 but was able to have a better pregnancy this time and went into labor last night and had a c-section this morning (her previous 2 were emergency c-sections) with her adorable 5lb baby. The other 3 ladies could go at any time now. I love new babies! Makes me baby hungry lol. - I love artwork by Simon Dewey, he does beautiful religious paintings. When was the last time you got a free lunch (or breakfast or dinner)? Who paid for it? - I have no idea, but Michelle probably paid for it, cuz she's nice like that lol. On a scale of 1-10 with 10 being highest, how emotional are you? - A 6 most of the time I think. Of course stuff like pregnancy or PMS can drastically change that lol. Approximately how long do you spend each day responding to emails? - Not long, I don't get many emails that need a response. To what temperature do you usually set your home’s thermostat? - I like it around 75*, hubby normally keeps it at 70 during the winter and I freeze! Wanna win a Dyson? Of course you do! So do I!!! I would love a Dyson vacuum, they have such rave reviews, everyone I know who has them highly recommends them and can't think of anything bad about them. Except of course the price lol. We definitely can't afford one, but I would love to win one, and you can enter to win one at 5 Minutes for Mom! They are giving away a cute pink Dyson! And, for each Dyson bought from Target they donate $40 to the Breast Cancer Research Fund, isn't that awesome?! Plus they are going to donate the full price of this Dyson ($400) to BCRF in honor of this giveaway! Holy cow I have a lot of exclamation marks in this post lol. Anyway, I hope I win! I keep falling behind on memes I get tagged for and awards I'm given so here's a big post for them before I forget again! If I've forgotten one you've tagged me for please let me know! 1- Cantaloupe. Mmm, one of my favorite fruits. Nice and juicy. 3- Trout. Especially fresh fished trout cooked over a fire, mmmm. 4- Cheesecake. When I visited New York we went to this little diner near our hotel and the cheesecake was sooooo good! 1- The night Hubby proposed. It was completely unexpected (he'd been going on for months about how he wasn't ready to get married) and I of course said "Yes!" then we laughed for about an hour while making plans. 2- Wedding. The whole day and night went great. We had a wonderful time. I remember when Hubby saw me for the first time in my wedding dress, he just stopped and said "Wow!" The weather was perfect, good food, lots of family and friends, it was all just so amazing. 3- When Toddler was born. I was so happy and amazed to have my little boy. It was late when I finally got to hold him after my c-section, after midnight. I got maybe 2 hrs of sleep that night and it was also one of my worst nights ever because of the pain and not being able to get out of bed and being so tired. But every time I looked at my precious boy my heart just filled up and I was so happy. 4- When Baby was born. I was so excited and on a high from my vbac. I remember not sleeping well that night even though he slept awesome and only woke once or twice. 5- Cancun vacation with Hubby in January. More than one night of course, but it was a wonderful vacation. 2- My eyes are a pretty very dark brown with nice long thick eyelashes, people always assume I'm wearing mascara but I don't. 3- This is silly, but I love my fingernails. They are usually nice and strong, smooth, and grow well. When they are nicely painted people ask if they are fake cuz they look so perfect. Of course since having kids they tend to get broken more and painted less lol. 4- I don't take offense easily, if something can be meant in a good way or a bad way I tend to assume it was meant the good way. 6- Sarcastic wit. It runs in the family. I think all of us kids got it from our dad lol. I try to be funny and sometimes I do a pretty good job, except in writing, it just doesn't come out the same. 7- My cute kids, I'm pretty proud of the fact that I made something so adorable (well, I guess Hubby helped a little lol). 8- I am easily amused, just ask Hubby. 9- Being a mom. I'm not perfect by any stretch of the imagination, but I love that I am a mom and try to do what I can to raise my kids right. 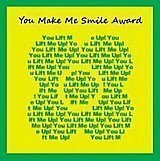 And finally one more thing from Mama Pajama :) She gave me a "You Make Me Smile" award, which originated from Miles to go... Aw thanks! And I am passing it on to anyone who comments on this post, because comments make me smile! Feel free to be tagged with any or all of these memes if you want to do them! Today I am thankful for Michelle who is going to watch my boys while I have an eye appointment, she's even taking them to storytime along with her 2, alone, she's brave! I'm thankful that I finally went to the eye dr and got new contacts (I'd been wearing the same one for at least 6 months!) and after this appt I will have a pair of backup glasses. And very thankful that after today we will have 2 doctor bills paid off, including the one from when Hubby hurt his thumb way back in February. I finally decided to make Baby lay down to take a nap. I put him in bed, gave him a blanket and said "It's time to take a nap." and guess what he did? He went to sleep! Not instantly of course, but he didn't try to get up, just fussed a few minutes then fell asleep. I am shocked that he actually stayed in bed without me in there with him! He has been doing better lately at going to sleep without someone laying down with him, I hope he keeps it up, especially at night! It sure would be nice if the boys had all napped at the same time! And Baby really needs to take another nap, he only slept about 15 minutes earlier and is sooooo cranky! I need to do some cleaning. Well, a lot of cleaning actually. There is popcorn on the living room floor, all the toys are dumped out in the boys room and slowly being scattered through the house, and the laundry I'm getting washed is piling up at the foot of my bed cause I haven't had a spare minute to fold it. Good thing dinner is super easy tonight cuz I really don't feel like cooking anything. Today's Heads or Tails theme is Keys. Today is our second day of preschool. I hope it goes better than last week :) Other than that I just need to clean up, do laundry and stuff. Boy, taking three kids under 3 out anywhere is crazy! Today we had to go to the bank, the dollar store, and the library. I carried Little Baby in the baby sling, Toddler was pretty good at staying by me, but Baby was a terror! He kept trying to run off, crawl out of the cart, and at the library he was horrible. He kept running off and pulling books off the shelves and if I held his hand he would keep going limp so it was hard to hold him while I had Little Baby and a bag of books. The only thing that was good was that Toddler was being a great helper, trying to keep hold of him, picking up the books, and keeping track of where he ran since I couldn't keep up lol. Now I have Toddler and Little Baby laying down for naps, and hopefully Baby will fall asleep too, I know he's tired. I don't know how I'll handle going out when I start babysitting another baby in December! I did a bit better this week :) Not perfect but an improvement over the last few weeks. One thing I haven't been doing well is all my nightly routines like lotion, floss, crunches, and vitamins. I really need to work on doing those. But I did better this week and am just going to keep working on everything :) I will add one new goal since it has been a while. I want to drink at least 4 cups of water each day. I know I should be drinking 8 cups of water every day but I don't :P 4 cups is a good start. We get a few hundred channels on satellite, but I can never find anything to watch lol. We have a billion ESPN channels but since I don't watch golf, NCAA Tournaments, or professional ping-pong I usually just skip those channels. Then there's all the business channels, educational shows, oldies, cartoons, shopping channels, and finally the adult content and pay-per-view junk. I wish there was a way I could just pick the few channels I do watch and just pay to have those lol. I only have about 10 on my favorites list. I usually just switch to that when looking for something to watch so I don't have to scroll through everything else. Not that I get to do that often, Toddler only likes me to have cartoons on lol. So our girls night out was a ton of fun. Michelle and I surprised our friend Melissa and took her out for her birthday. We went to a little sandwich place to eat, then walked around the mall for an hour, then went out for ice cream. We had so much fun just talking and stuff :) It's so nice to get out without the kids once in a while. I'm going out with a few friends tonight. Not sure what exactly we are doing yet, maybe going to dinner. I love getting out with just a few other moms, away from kids and cleaning, just talking and having a good time. Woohoo! I'll let Hubby deal with our fussy Baby by himself for a few hours to give him a taste of what I've dealt with all day lol. Poor Baby had to go for his 15 months checkup yesterday. After waiting about 45 minutes for the doctor with 2 restless kids in a small office, she finally came in. He's nice and healthy, though on the small side, still only 20lbs. But since he does fine with all his other developmental stuff she's not worried about him being small. But he also had to get 3 shots. He cried for just a minute and was fine the rest of the evening. But he slept horribly last night. He went to bed around 9 and was up at 10, 11, 12, 1-2, and finally stayed asleep til 7. And today he has had a fever and been fussy but we are out of infant medicine. Luckily Michelle's family came over to play in the water and she brought me some medicine for him. Now they are all out having fun and I'm heading out to join them! - When Hubby got the tip of his thumb ripped off in February. The last time I was there for myself was when I had Baby. 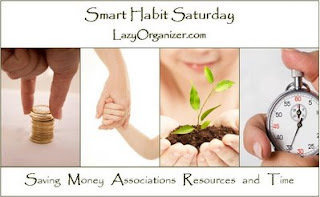 - Procrastinator's Playgroup: Where you can go to get away from all those pesky responsibilities. Today I am thankful that I was able to get out of my grumpy mood and get some cleaning done. I am very thankful for my Hubby who always helps me with the house and kids, even when he gets home after a long day. And I am thankful for Toddler's little friend. Even though they can create quite a tornado when they are together, it helps me when they go off to play and I can turn off the cartoons for a bit lol. Oh, and I'm thankful that Little Baby napped well today, all week he hasn't napped as well, but today he did and it gave me some much needed peaceful time. Please share with us what you are thankful for today! I am in sucha better mood today! It really is amazing how cleaning can actually make you feel better. I spent an hour ripping my hair out and trying to get Toddler to listen to simple directions helping Toddler clean his room, folded the 3 baskets of laundry at the foot of my bed, got another load of laundry started, and put the books in the office back on the shelf for the bazillionth time. The house definitely isn't spotless, but thanks to Hubby helping clean up the living room last night it looks lots better and isn't stressing me out. I think I deserve some ice cream! Man, I have been so grumpy this week! I don't know what's up but I just get annoyed at everything, don't want to do anything, and just all over grumpy. Ugh, I hate it. And my house is a disaster from me not wanting to do anything, and that just makes me grumpier. I think if I can get caught up on my cleaning I'd feel a bit better. I also had an orthodontist appointment today so my teeth hurt, no fun. Tomorrow Baby has a checkup and shots, poor little guy. I better go see what mischief Toddler and his friend are getting into downstairs. Where were you? How did you find out? How much did it affect you, if at all? Is there anything else you want to say about it? I was a senior in high school. I arrived at school that morning unaware that anything different would happen that day. At my locker before class my friend was telling me she heard that somebody had exploded a bomb in the World Trade Center. I didn't even know what the WTC was at the time and kind of shrugged it off as something minor and the police would catch the guy and all would be well. As I walked to class I hear people muttering in groups about plane crashes and terrorists, but wasn't really paying attention. I got to class and the teacher had the news on and I finally saw what had happened. I think this was just after the second tower had been hit. We watched in shock as the news poured in about the crashes, then the Pentagon attack, seeing the towers fall brought cries from the whole class, hearing about the valiant policemen and firefighters who died in the line of duty, and then the crash in Pennsylvania and the heroic efforts the passengers had gone to to stop the hijackers. We moved like zombies to our classes, but nobody was doing any work, the teachers sat glued to the TVs with us, hardly saying a word. Students were allowed to go home at any time, some crying and terrified or worried about friends and family in the affected areas. After school I went home and sat with my family as we watched the news replay over and over again the horrible events. I think the news was on nonstop for the next few days at my house. It felt like our safe little world had just crashed around us and nobody knew what to do or how to react. And as the shock wore off I remember how it felt like the whole country had united and rallied together in love and compassion and pride. 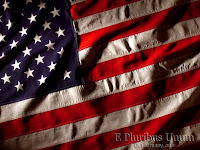 Flags appeared on every lawn, radios were on blaring patriotic songs, and the country mourned together for the loss of innocent lives. I think it was a wakeup call to me. A reminder that nobody, or country, was invincible, and that there is great evil out there. My prayers will be with the family and friends of all those who lost loved ones in the attack 6 years ago, as well as in the war against terror, and for our brave soldiers (and their families) who fight for our country. Well, preschool didn't go quite as I pictured it, though it didn't go as bad as I imagined it could lol. I didn't realize it would be so hard to teach a litter of puppies 5 toddlers how to draw a straight line. One kid wouldn't say anything, one wouldn't leave her mom's lap most of the class, and 2 (including my Toddler) just wouldn't be still or quiet lol. I'm hoping that as we get more used to teaching and the kids to being there, that it will get easier and less chaotic. I think if we had a little table they could sit at it might help, but not sure where we could get one cheap. My friend Michelle has a friend who is also a blogging mommy, Jenn. Jenn's little baby Ian was born with a heart problem and had to have heart surgery shortly after birth, and they have gone through a lot already in his short life. Recently he was put back in the hospital a few hours from home, because his heart is not functioning properly. He is on medication and will probably be having surgery to replace a valve and likely need a heart transplant at some point in the future. Their family is going through so much, and I can't imagine the stress and worry they are experiencing right now. Please keep Jenn, Ian, and their family in your thoughts and prayers. And feel fre to put this button on your blog if you like. Today has been one of "those" days. A day where I just wanted to crawl back in bed and wake up tomorrow. Before noon I'd already had to clean up throw up and poop a few times. And had to clean up poop again a few more times throughout the day. We are working on potty training Toddler, but he still has a problem getting to the toilet in time when he has to poop. Then there was fussing, screaming, mess-making, and more all day. I have a major headache and just hope that tomorrow goes better. It seems like fall has officially started. The weather's been chilly the last few days, almost to the point of turning on my heater at night, but not quite. It's nice to get a break from the heat, but I know it just means the cold and snow will be coming in a few months and I hate that more than heat. Times like this I envy people with hot tubs, I'd love to have one to hop into on chilly evenings. I have to settle for my little bathtub with kids banging on the door while I try to relax lol. Hm, I think I'm going to make myself some yummy hot chocolate and watch some TV with the boys. Dawn at Because I Said So recently posted a few posts on multi-tasking. She made a comment about how women multi-task better than men but also posted that because men have a "one-track mind" they are better able to focus on one task, accomplishing it faster and better, while a woman can do 3-4 things at a time, but will usually lack in quality. I completely agree. When my Hubby sets his mind to a task he doesn't get sidetracked, and works on it until it's done, and he does a good job. I tend to try to do 2-3 things at once, and usually end up with 2-3 half-done projects and a headache. Of course there are exceptions, men who can multi-task and women who prefer to work on a single task, but I think in general this concept is true. What do you think? I don't know why it's so hard to get to church on time every Sunday. It's at 9am and every other day of the week we are up and going hours earlier, but for some reason it's just so hard to get ready by 9am lol. Hubby normally sleeps until 8:30 so I pretty much get the kids ready by myself then have to get Hubby up then I can get me ready. We always arrive about 5 minutes late. Which is sad cuz it only takes like 3 minutes to get there. We need to try harder. I love getting the mail. I have no idea why. I sit by the window with Toddler and watch the mail truck come and put the mail in our box, sing the "Mail Time" song from Blue's Clues to the boys (complete with dancing), and then run out and grab it (and then of course I have to sing the "We just got a letter" Blue's Clues song for the boys). Of course we normally get stuff like "This offer expires soon! 0% interest for a year!" and stupid Dell magazines with "Special sale on Dell Memory, 35% off through Saturday!" even though I have never (and probably will never) bought a Dell computer. Then there's the Woman's Day magazine that comes for Hubby that we never signed up for, TV Guide that I don't remember signing up for but probably did, and all the other junk. And if it's not junk it's bills and statements. I usually hand the junk to Toddler to open cuz he likes getting mail too. He comes up and goes "Is dat my maiw?!" so I give him a stack of credit card offers and let him have fun. We don't usually get "good" mail like cards, unexpected money, or stuff like that. But I still like checking the mail, it makes me feel special and is fun for the kids lol. So, I have been doing so horribly on all my goals, even the ones that had become habits, now I need to start all over on those. I was doing awesome with saying my prayers and reading scriptures, but even that has declined, so I really want to focus on those this week. I'm going to print out my goal list so I can see it more often during the day and hopefully remind myself of what I should be doing. Thanks Beth for checking on me ;) I actually did a quick clean in the office, took less time than I even thought. In about 5 minutes I had everything cleaned off the floor and it looks much better now. I just need to organize the desk and vacuum now. Of course I can't vacuum while the boys are napping so I took a short nap with them instead :D I'm going to take a few things downstairs, and Little Baby should be waking up any second now. So, I'm not doing too good on my new chore routine. I set it up to focus on one room a day but haven't really been doing it. Today I am supposed to clean the office. I know it would really only take about 1/2 hour to clean it up but I just can't motivate myself to get started. OK, when I get the boys to nap in about an hour, I promise I will clean my office. You guys better hold me to it :D Hopefully telling someone else I'm going to do something will get me motivated lol. I would love to have a cute sporty red convertible. Of course with kids that is just not practical, maybe when they finally are grown and moved away. For now I want a new Honda Odyssey with all the extra features- power sliding doors, built in DVD and navigation systems, etc. I don't think I've heard anyone with an Odyssey say they don't like it, everyone loves it. We have a 2001 Ford Windstar. It gets us where we are going but I'd like a better minivan. Or at least one with all 4 doors working properly. I know Hubby would love a big truck and I'm sure he would want all the cool features you can get in a truck, though I have no idea what those would be besides a nice truck bed liner. What do you get for extras in a truck? I guess a navigation system (and what guy doesn't need a navigation system? lol) and all the regular power stuff. Honestly I'd love a nice truck too, but right now I can't think of a good enough reason to get one unless we get rid of our Cavalier, which we don't want to do. It'll have to wait until we get the car and van paid off. I always look forward to weekends. I'm not sure why. I don't get to sleep in because the kids still get up at the same time whether it's a weekday or weekend. I still have to take care of the kids and house, cook, clean, etc. We usually don't plan anything fun like camping, boating, picnics, or anything like that. The only thing different is I don't watch Little Baby and Hubby is home to help. I guess that's why I like weekends, Hubby is a big help to me. He helps me clean up, changes diapers, I can run errands without taking the kids, and it's nice to have a 2:2 adult/kid ratio, instead of 1:3 lol. And now that I've mentioned it, a picnic does sound like fun, maybe I'll plan one for tomorrow! Using only one word, how does grocery shopping make you feel? What is your favorite part about the season of Autumn? - When the leaves change color, it's so pretty! Have you ever had any bad experiences online? - I've come across people I don't agree with, and been on messageboards where there's been huge disagreements. That's about it. Name three things that make you happy daily. What one household cleansing or organizing item would you not want to be without? - Vacuum. My floor gets so bad and there's always crushed something-or-other in the carpet. I would go nuts walking over that all the time. Adventures in Babywearing is having a contest to win an adorable ring sling from Rockin' Baby. Even though it is pink, I would still wear my boys in it, it is just too cute! 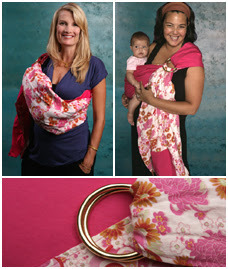 Rockin' Baby has such cute slings, you have to go check it out. The material they use is just so cute and fun! Today I am thankful for cool weather and rain. Hubby just planted grass on Labor Day so the rain has been a big blessing because we won't have to water the yard all day. And the cooler weather has made the house much nicer to stay in. No a/c needed. I am also thankful that all 3 boys are napping right now. I should be cleaning, doing dishes, etc but I decided to grab a bowl of ice cream and relax for a minute :) If I get time after finishing my ice cream then I'll do dishes. Hurray! They are all asleep! At the same time! I better hurry and get some cleaning done! Man, it's sad that I look forward to nap time so I can clean :P There used to be a time that I took naps myself, but that rarely happens these days. There are more important things to do. I really should be doing some cleaning while the kids are being good. Toddler is napping and the other two are being quiet and good. I just know that if I do start cleaning Baby will come try to "help" me. When I do dishes he tries to help unload, whether they are clean or not. When I sweep or vacuum the floor he likes to follow along picking up lint, batteries, spilled food, and garbage and trying to put them in his mouth. As I put toys away he takes them back out and dumps them all over the floor. Silly boy. And I can't get him to nap today either. He normally naps around 11am and again in the evening, but so far he just won't sleep. So I figure since it's worthless to clean with him awake, I might as well put it off until Hubby gets home to run defense for me. Today, along with babysitting Little Baby, I'm also babysitting my other neighbor's 3-year old until noon. 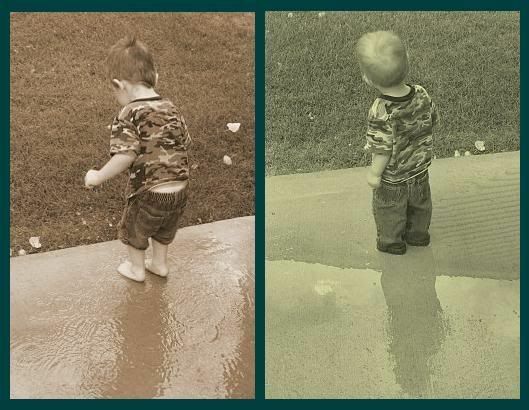 He is a cute kid and great friends with Toddler, but getting them together, especially on a cold rainy day when they can't go outside, is just chaos! They are little balls of energy zooming around the house, leaving a trial of destruction in their wake. Why is is it that when you get 2 normally well-behaved toddlers together their energy is multiplied by 100?! And although their are 2 sets of ears, they listen only 1/2 as well?! And of course today had to by rainy and freezing, otherwise I'd take them out to play in the yard and let them run out their energy where they can't make so much mess. Good thing Baby and Little Baby are being so good today or I'd be going insane. Just one more hour, then maybe I can send Toddler off to play at his friend's house and I can pick up the pieces of my house. I was recently contacted to try out and review the LUVS New Bear Hugs Stretch Diapers. Of course I said yes, because who turns down free diapers? With 2 little kids in diapers I gladly accepted. I figured they'd send just a few for me to try but they actually sent a whole pack of size 4 diapers. Now, I have tried Luvs before but didn't like that the waist wasn't stretchy, so I figured these would be about the same. Boy was I wrong! These diapers were great! Here's a breakdown of the three main aspects of these diapers- stretch/fit, absorbency, and smell factor. Stretch/Fit- My boys have skinny legs so most diapers don't fit well around the legs, these were a bit better, not perfect but fit pretty well. Though if I'd gotten a size 3 they probably would have been perfect on Baby, the 4 was a bit big. Overall the leg fit wasn't too bad though, no leaky messes. And the new stretchy waistband was awesome! It was so stretchy! I loved how easy it was to get them to stay on my skinny boys' waists, even standing up! And the tabs were strong and durable. Absorbency- Super super absorbent. Seriously, these babies can hold a ton! Normally with the brand we regularly use, if I don't change Toddler first thing in the morning he will get leaks running down his legs. I decided to test the absorbency of Luvs by leaving a diaper on Toddler all day. (Disclaimer: I do not like leaving kids in diapers all day, it's gross and just plain mean, this was strictly scientific study lol.) So he wore that diaper all day, and not a single leak! It was full and heavy, but not a drop escaped. They have a leakguard center to help hold in the leaks. Smell Factor- These Luvs diapers are scented. It was great for masking normal diaper odors, I couldn't even tell if a diaper was stinky until I changed it. But it seemed to have too much perfume, at times it was annoyingly strong. Plus Baby has slightly sensitive skin and started to get a rash from all the perfume stuff in the diaper. I would probably prefer an unscented version of this diaper. So overall these diapers were awesome! I would definitely recommend them to anyone with kids in diapers. I give them 4 1/2 flowers! Today's Works-for-Me Wednesday is all about what brands we are loyal to. This is hard for me since we almost always buy generic cheap everything. One thing I have to have though is Oreo's. Generic cookies just don't cut it, they aren't very good. Oreo's are perfect, yummy and dipped in milk they can brighten any day. That's the only brand I can think of right now that I just won't settle for generic. Oh wait, there is another. Stove Top Stuffing. We tried the generic Great Value stuffing and it was so gross! I would definitely pay a few cents more for Stove Top, so much better. OK, there's the brands I'm loyal to! Head over to Rocks in My Dryer to see what brands everyone else likes! Baby is so adorable! This is him saying "Cheese!" to the camera. He was giving Hubby and me kisses today, those open-mouth, slobbery kisses that are disgusting, but who can turn down those cute baby kisses? And we taught him how to blow kisses so now he goes "mwah!" while hitting his mouth :D He kept walking back and forth from me to hubby giving us kisses and giggling. It was so sweet! I just love my little boy, and I love being a mom. It's crazy how fast kids grow up. Baby seems to learn new words every day and he's only 15 months old! It makes me sad to see him changing so fast, but of course I am proud of my boys and everything new they do makes me so happy to see they learn and grow. I'm sometimes in awe that these are MY kids, so smart and adorable and loving, it's amazing! Today's Heads or Tails topic is School. I never really liked school. I hated homework, especially writing papers, and most of the time I was very unpopular. I did well in school though, got mostly A's even though I hardly did my homework. I took college Spanish and Algebra/Trig my junior year of high school. I liked high school better than elementary or junior high because I actually had groups of friends, and wasn't unpopular. Then I went to college. I changed my major 3 times in as many years and never graduated in anything. One day I might go back to school, but for now I'm enjoying being a stay-at-home mom. So I decided to give potty training another try with Toddler. The last time we did good for about 2 weeks, then just slacked off and he didn't want to do it anymore. This weekend I decided that I am sick and tired of changing his diaper all the time so we are working on it again. We let him run around without a diaper and about every 1-2 hours I ask him to sit on the toilet (he prefers it to his little potty). He goes almost every time! Yay! Of course if he has a diaper or even underwear on he will go in those, so it might take a while to teach him not to, but for now just having a few less diapers to change a day is a great break! I've already gotten started on folding laundry, I need to get Little Baby settled down again so I can finish it and start another load. I've made myself a weekly cleaning chart, one room a day, and today is the kitchen, so I'm going to work on getting it nice and clean. Of course I still have daily chores that need done like laundry and general picking up too. We'll see how it goes. It's been a crazy tiring weekend. I'm heading to bed soon and hopefully can get some good rest. For some reason I've felt so blah lately, tired and not wanting to do anything. My house is a mess, laundry and dishes just pile up but I don't even care. I'm sure part of it is that I haven't been cleaning, the mess makes me depressed and unhappy. I know if I cleaned up a bit I'd feel better but I just don't have the energy or will. It's just a crazy cycle. I haven't even felt like blogging lately, my posts have been forced out of habit, not desire. I think I'm experiencing some computer burn out. I've spent too much time on here and now it's more like a chore than anything else. I've neglected things I need to do and now feel like it's a waste, but I have a hard time pulling myself away from the computer. I really need to set myself a schedule of when I allow myself on so that I can do some things in real life like clean and play with the kids. Lorie has passed on this award to me. Thanks Lorie! She actually gave it to me a few weeks ago but I kept forgetting. Now it's time for me to pass it on. The Nice Matters Award: This award is for those bloggers who are nice people; good blog friends and those who inspire good feelings and inspiration. Also for those who are a positive influence on our blogging world. Once you've been awarded please pass it on to others who you feel are deserving of this award. Michelle, Life is Just Ducky- Michelle is one of my IRL friends who is so sweet. She is a great friend and always so thoughtful and willing to help. Dawn, Hmmm.....- Dawn has a lot going on in her life but still makes time to visit her friends blogs, and she tells funny stories about her family too. I know so many nice bloggers it's hard to just list a few, but I need a nap and had a hard time writing just these lol, but I appreciate all my bloggy friends and those who read this and comment here, you all deserve this award! Well, we did it! The 5k is over! It was hotter than we had thought it would be, so that made it harder, I had to stop and walk a few minutes. I could barely keep myself from throwing up at the finish. But we finished and didn't come in last! I even placed 3rd in our age group! Got a cool little trophy and everything :D And Michelle did great too, even though she was sick, so go give her a pat on the back. I'm glad we were able to do this. I'm amazed at the people who ran the marathon and half marathon, I can't even imagine! 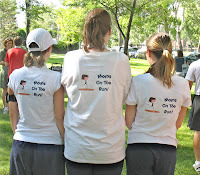 Even some young teens and older people (70+) ran those. I don't think I could ever be in that good of shape, or enjoy running enough to do that lol. Anyway, I will try to get a few pics of it up later once I get them off my camera. Yay me!